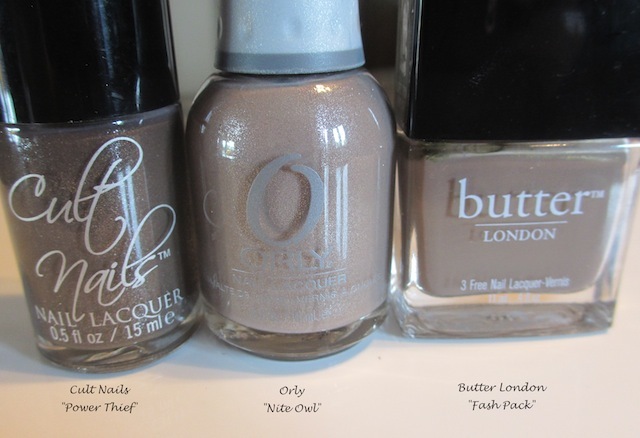 Here are the polishes I have that came to mind as dupes. When I put them together, they aren't. Cult Nails Power Thief has the same shimmer, but is a tad darker. Fash Pack is the same taupe color, but the shimmer is more golden. I have All Hail the Queen and this does look close to me. I almost want to get it anyway. Like you, I'm a sucker for a good neutral! Love it! I have two European dupes for it myself. Not even together they make the price of the BL! Gahhh, this is GORGEOUS. It's been on my wish list for like forever. I can't find it anywhere! So pretty! I've been to my Sally's and Ulta quite recently. They have tons of Lucky Duck, but no Nite Owl :( I'll probably have to swap for it!